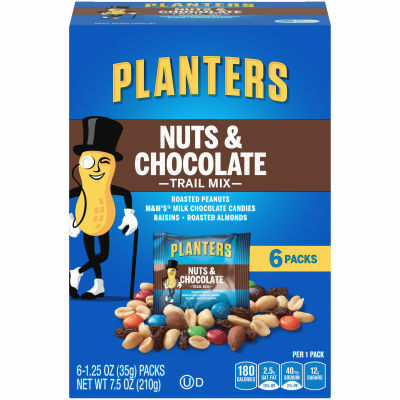 Planters Trail Mix Nuts & Chocolate - A great snack for school, work, road trips and more, this Planters Trail Mix Nuts & Chocolate features a delicious blend of salty and sweet treats. The balanced blend of flavors ensures that there will be a little something for each member of your family to enjoy. Salty, Sweet, and Totally Satisfying - The Planters trail mix contains roasted peanuts, almonds, M&M's milk chocolate candies and raisins. The nuts provide plenty of protein and healthy fats to help you stay full throughout the day, while the chocolate and raisins give you a quick boost of energy. This convenient value pack features six resealable bags. Serving size 1 Pack (35g).